Yesterday, despite the wacky week of work we're experiencing, the girls and I snuck out and played hooky at the Spokane Fair. 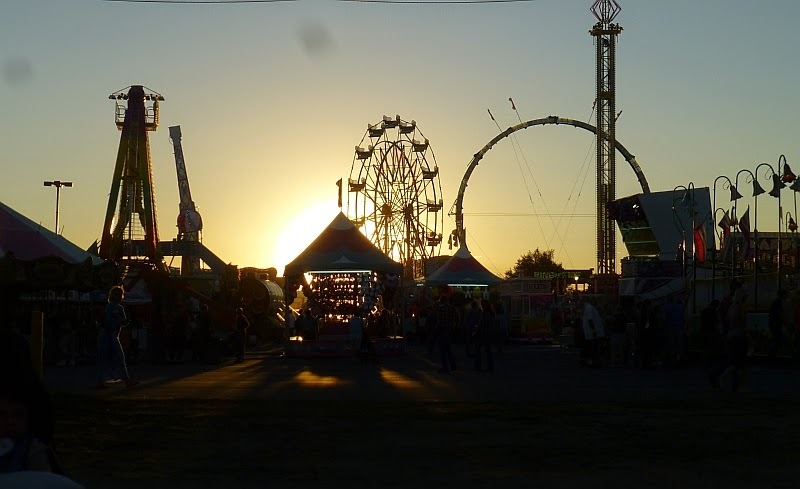 We've also concluded that Tuesday afternoons are the best time to go to fairs -- all the fun but none of the crowds. Poor Don stayed home and worked. Saw this handsome spike buck on the way out. At the fair, we started by touring the "bling" booths in the exhibit halls. What can I say, we have teenage daughters. We passed a booth promoting atheism (interestingly, it was located three booths down from a Christian booth). "What I don't understand," noted Younger Daughter, "is Christians try to convert atheists because they believe they're saving them. Why are atheists trying to convert Christians?" We went into a sort of petting zoo that had, besides the usual assortment of goats and sheep, some impressive longhorns, watusi, and other interesting and exotic breeds cattle. This youngster was having a fit of giggles as a goat reached for him. In the livestock barn they had a camel. It's interesting to see one of these close up. In one of the agricultural exhibit halls, they had tables with puzzles for those who needed to sit for awhile. I thought this was a splendidly thoughtful idea, and in fact the girls worked on this puzzle for a bit when we were tired of walking. 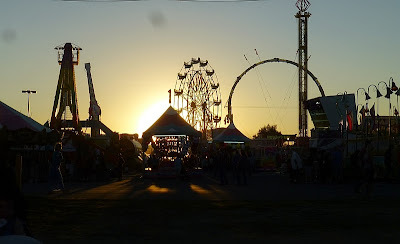 When the sun set, we walked onto the midway, the best time to admire the lights. I just love midway lights at dusk. Older Daughter went on some of the rides. Here she's on the "Ali Baba." That's her, raising her arms. But much of what we did was just walk around and gawk, at both the lights and the wild rides. There was one particularly horrifying ride appropriately called the "Freak Out." I say horrifying because I'm scared to death of zero-gravity sensation -- a serious phobia -- so carnival rides are like the "entertainment from hell" for me. I can't even handle a Ferris wheel because it comes down too fast. This ride would take sixteen passengers and swing them back and forth (as well as rotate them) terribly high. I don't think there's enough money on the planet to convince me to step foot on this thing. It was fascinating to watch, though, in a train-wreck sort of way. We left sated with sights and grateful for the break from work. Looks like everyone had fun. Our state fair starts this Thursday I believe. Always fun to go and support the kids with their homemade projects, the FFA, and some unique food items. Lookis like fun. We missed the fair this year-- I hyperextended three toes the day we'd planned to go (my folks have a tradition of visiting the last night of the fair); two hours and one hydrocodone later, I had an addled head AND a very sore foot, so walking around a chaotic environment with three small children and a teenager for hours was out unless absolutely necessary. I had some sad kids, but pizza and movies made up for it. About the atheists: Some of them mean well, and are trying to save people from wasting their one and only existence on restrictions, sermons, hellfire and damnation, and guilt. Some of them mean well, and want to see people who don't fit the Christian mold freed from condemnation in this life. I can empathize with those people-- I don't exactly fit the Christian mold of a Godly woman. After much prayer, I have come to accept that God made me this way for reasons only God understands; I will just have to accept it, and accept that it means that I will never be accepted in the church. Condemnation for my faults (social awkwardness, inability to make chitchat for extended periods of time, preferring "male" activities to "female" ones, being very uncomfortable in "feminine" clothing and having little fashion sense, liking canning and baking and 'green' living and the other things that bring me to your blog, a belief that members of other religions and homosexuals and others of "Satan's children" should be treated equally here on Earth, experiencing mental shutdowns at things like church socials) is painful; for many years I rejected Christianity and sought a more accepting religion (in vain, I might add). I guess the difference between me and the outspoken atheists is that I outgrew condemning an entire religion because of it, and instead chose to accept that I am undesirable and live with that pain instead of externalizing it or trying to change others. In a more extreme version of that vein, unfortunately, quite a lot of them merely seek to validate their own understanding by invalidating everyone else's. And that's, well, sad. Reads to me like a description of Asperer's, a God-given neurological difference, much-inclined to integrity and truth-telling. You're confusing faith in God with organized religion. You can be a perfect Christian and never set foot in a church. You pretty much described me to a t. Social gatherings are something I dread. I'm going to school to be an auto/diesel mechanic and I have a heck of a time finding clothes that fit but aren't frilly and "girly". God touched me though so I don't deny him. I don't attend church. Too many hypocrites and too many social situations that are too hard to deal with. I never saw why the heck I needed to purchase and wear nice clothes just to go to church. Isn't it supposed to be about God's word and living the life He commands us to? Instead it's become about coming to be seen and to show off. No thanks! I'll worship privately at home. God knows what's in my heart and that's all that matters. Here in the hometown of Krispy Kreme doughnuts, cheeseburger glazed doughnuts are not uncommon. I still will not have one...neither will I try deep fried butter, as much as I love butter, I want it on bread! I love the fall fairs and and the senses it awakens! Don't forget that the Latah County fair starts on Thursday in Moscow. The Elephant Ears are great. The fair does sound fun! Are there still booths for people to show their canned goods and big pumpkins and quilting , or am I foolishly dating myself? Nope, you're not dating yourself. They had halls-full of home canned goods, garden veggies and fruits, quilts and other needle arts, art work from various ages, etc. Warms the heart to see it all. We missed our fair this year so it's extra fun to peek at yours. I love the midway lights too! And fair food... ohhhh... I missed the chance to get Poffertjes! Really looking forward to going there next year! I've never been to a real country fair, they are too far away on the east coast. A local minor-league baseball stadium (GCS Ballpark in Sauget IL, home of the Gateway Grizzlies), sells a Krispy Kreme cheeseburger. I haven't had one, but several friends of mine have, said they are fantastic. When GCS first rolled them out a few years ago, a newspaper article said they had worked for months to find just the right kind of ground beef, and the right flavor of cheddar cheese, to make it work. One of these days, I'm gonna try one myself! If for no other reason, just so I can say I did so. You can tell your daughter that I am an atheist and I have no interest in converting her to atheism, nor do any atheists I know. If an atheist group had a booth at the county fair, it would be for the same reasons a Christian group/church or Democratic/Republican candidate has a booth: to promote awareness of our group and what we represent, to find people who are interested in joining us to work on solutions to the issues about which we care, and to foster community among like-minded people. A final reason an atheist group might have a booth, or a billboard, or march in a parade, or sponsor a community event, is to dispel stereotypes and show the community that atheists are ordinary people who do not believe in God, not evil, cynical, or whatever the prevailing stereotype might be. I once had a dental hygienist ask me what church I attended and when I told her I was an atheist she said, in horror, "You mean you hate people? ", followed by a dozen questions about why I hated God, why I believed in satan, why I didn't believe the Bible, etc. It was a baffling experience for me, to find someone who so completely misunderstood where I was coming from and what I did or did not believe. I hope that helps her understand the reasons why an atheist group might pay the $25 to host a booth at the fair. A thoughtful explanation -- thank you. You're welcome. I do enjoy much of your blog; though we differ in our beliefs and politics, we have rural WA, an interest in living sustainably, and homeschooling in common.